I really enjoy learning more about what other countries do at lunch time and the national policies that govern their behavior. I hope you enjoy today’s guest blog post from a Finnish mother. 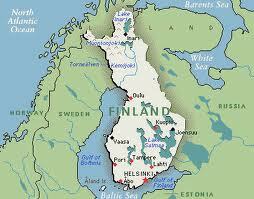 Finland’s education system has been receiving worldwide praise. Yesterday, December 6th was Finland’s 94th anniversary of its separation from Russia. Note: many of the links lead to Finnish webpages, which can be translated with the help of Google Translate. I am mother who has recently experienced school lunch system in two countries via my elementary age children. And third country experience is upcoming next year. First I joked about it but being nutrition researcher by profession, it was natural for me to get interested in the school food issue further. Unlike Mrs Q, I was inspired and empowered by nutritionist colleague Janne Huovila, who is training health professionals to participate in social media. Now I have been writing blog since March 2011 with motto being “to find what different factors affect school meals”. My kids started their school life in France when we moved there from our home country Finland due to my husband’s job assignment. For two years I picked my kids from school for lunch at home, as quite many of the French mothers did too in that town. From France we moved to Austin, Texas in fall 2010. Here I had to get used to packing lunch. The small private school has catering service delivering packed lunch, that I professionally concider good quality. But I felt my children had enough stress with the new school and having familiar foods for lunch would give them break in the middle of the day. Besides that way I knew they would eat during the school and well nourished better cope and adjust into new environment. The good thing is that our school gives opportunity to heat food in the microwave and school assistants have time to help children. That gives more chance for variety in lunch box and when home cooked foods do not need to be hot in thermal, they are more appealing during the lunch time. But this lunch packing is also quite stressful! So I started to look forward to our return to Finland. There I knew school would provide daily hot lunch to all students. And without direct cost to family (paid by taxpayers). That has been in Finland since 1948, being the first country in the world. And the quality of lunch would also be worth looking forward to. Finland has had school nutrition recommendation since 2008 and even before that school lunch followed the current national food recommendations established by National Nutrition council since 1954. As I got into blogging, I noticed more and more current negative news from Finland about school lunch. Specially teenagers are skipping the free meal. For what ever reason they do not eat at all in school canteen or they rather use their own money for buying junk food outside school if there is a chance. Then become news headlines calling crap the food served in school! In internet comments sounded like parents also would call proper lunch crap food. Even without seeing the lunch at all, basing their judgement on their own memories of school lunch, the news headlines, and from reports of their children. Hey, even I get negative feed back from my kids for what I have packed to them to eat in school! Nordic Network of National Technology Platform’s Healthy Choices project states: Results from surveys among parents and children have indicated that some children don´t like the food. Healthy food does not give children the necessary nutrients unless it´s eaten. Therefore, the main challenge is not only to make sure the food is healthy and nutritious, but also that it tastes good and is nicely presented in a pleasant atmosphere. And one of the obstacles on the way overcoming the challenge is lack of respect for school catering from politicians and school authorities. Does that sound familiar? I give my guess for the reason to negative news and therefore negative image; People do not know what to respect in free school lunch. By doing internet research I found out that like in US, Finnish school food is heading towards more local and organic products but unlike in US, our school lunches have always been made by big part from the scratch in the local muncipal kitchens. Obviously these issues had been overrun by negative topics generating vicious circle. Before moving out of Finland I had some experience and knowledge about school food via my work as nutrition researcher in one nutrition intervention study with study population being teenagers at that time. There I saw that for many of them school food was the best food they got during the day. And quite often school lunch was the meal containing the least amount of food additives. Those who got proper dinner at home ate also quite well school lunch. This recent study supports my observations: Eating a balanced school lunch is associated with more regular meal patterns, the availability of healthier foods at home and an overall healthier diet, suggesting that healthy eating patterns are learnt at home. But what if home does not give opportunity to learn healthy food habits? Finnish legislation and nutrition recommendations state: The role of school meals is to be a pedagogical tool to teach good nutrition and eating habits as well as to increase consumption of vegetables, fruits and berries, full corn bread and skimmed or low fat milk. For this purpose in Finnish schools teachers eat with their students at least in the younger grades, but quite often also in middle school. It was just few days ago that I heard about EU project called Habeat: HabEat will (also) propose strategies to policy makers for promoting practices to ensure healthy food habits in young infants and children as well as intervention. I have already seen changes towards positive school lunch image and atmosphere in news headlines. Like this one stating “School food is good“. What really delights me is that one teacher is reporting actual school food eaten in typical Finnish school via photos and testifying the good quality and variety school lunch has. Official information how Finnish school canteens work and how well-balanced meal is composed, served and guided to students in self-service basis without individually wrapped items can be found in document School Meals in Finland – Investment in learning and in this Nordic Network NTP raport. Finland is also demonstrating proudly abroad it’s long tradition of catered school meals. This fall The Embassies of Scandinavian countries served Nordic food at DC schools on Nordic Food Day. In September 2011 Finnish Ministry of Education offered typical Finnish school lunch to high-level United Nations guests. The purpose of the event was to outline the connection between a healthy diet and development. Not unfamiliar idea in US, but Finland is very good example of that phenomenon as it has been among the top in the PISA ranking for several years. There is no doubt that equal opportunity to all students for healthy lunch supports the work that has done on the educational sector itself. More about Finnish school system can be found from these two articles published in in November 2011 and this Canadian tv-document published December 2, 2011. Dear Fellow Parents. I hope this information from Finland empowers you to look ways to ensure your children get and eat good school lunch so they can thrive. I’m a Finnish American (so I have to show support for my heritage here! ), and my mom has told me about this before. I’ve always thought that free hot meals at lunchtime was a great idea. As a high school student in America, I know firsthand how hard it is to concentrate in school if you’re hungry or even just eating unhealthily. Preventing this is sure to make students happier, healthier and ready to concentrate in school. I only wish there were pictures or some description of the type of food which is actually served. To Malia: Thanks for your interest in Finnish school food. For photos, please go and see the link of one teachers blog or from here http://www.properuskoulu.net/search/label/kouluruokailu. And here you can find Helsinki’s (capital of Finland, and therefore the biggest school caterer in Finland) school menu in English. As I wrote in the text and can be seen in this link photo, food is mainly self-service basis without any individual wrapped items. And as can be seen from photos from the Finnish teacher, eaten from real plates with forks and knives. I made one page with recipes and photos of very traditional and typical Finnish Christmas school lunch.